Laurel Oaks students created this show truck, which participated in the annual Findlay Market Parade to celebrate the beginning of the Cincinnati Reds baseball season. When Laurel Oaks instructor Gary Bronson got a 2013 International Pro Star for his high school program, he knew that the truck would become a project for more than just his Industrial Diesel Mechanics students. And after months of work, the truck made its debut at the recent Cavalcade of Customs auto show in Cincinnati and participated in this week’s annual Findlay Market Parade to celebrate the beginning of the baseball season. · Welding students built a mounting system for the rear fenders, built a headache rack for the back of the cab, and used a CNC plasma cutter to cut designs into the rack. · Auto Collision Technology students prepped and painted the rear fenders. · Digital Arts and Design students designed and created graphics for the truck’s sides and a “Career Ready” banner for the front. · Computer Service Technician and Networking students set up a video display with the truck. · CareerX students helped get the truck ready for public viewing. The students were involved as part of a SkillsUSA project. With Bronson’s vision, and the students’ work, Great Oaks now has a truck for Industrial Diesel students to sharpen their skills on as well as a rolling reminder to the community of the professional skills and talents these high school students have. “And it only took me seven years (of proposing the project) to make it a reality,” Bronson laughed. 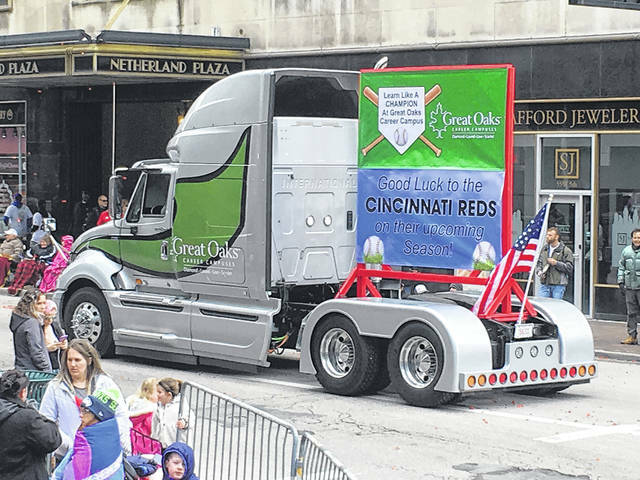 https://www.recordherald.com/wp-content/uploads/sites/27/2018/04/web1_IMG_0671.jpgLaurel Oaks students created this show truck, which participated in the annual Findlay Market Parade to celebrate the beginning of the Cincinnati Reds baseball season.